This series of articles pays homage to our collaborators in the Copper Canyons. Without them, our projects with the Raramuri communities would be almost impossible. They invest their time and their hearts, away from the limelight, and help make our common vision of peace and sharing a reality. We present this acknowledgement as our humble thanks for all they do, and for being our friends. Josue Stephens was an early Mas Loco and was inspired by Micah True himself to become a race director in Nicaragua, where he created the now internationally-known Fuego Y Agua ultra event, on Isla de Ometepe. As the child of a traveling family of misionaries, Josue spent part of his childhood living in the Copper Canyons, in the Batopilas region. He speaks Spanish fluently and has developed strong ties with many communities in Central and South America. When Maria Walton was left with the task of perpetuating Caballo Blanco's race, Josue stepped up and offered his extensive experience and resources. As a personal friend, a Mas Loco and a philanthropic race director, Josue was a natural choice and a great partner for Maria. Together, they not only continued Micah's vision and dream, but also brought new dimensions to it with events like the children's race, which has now become an important part of the Copper Canyons race week. Josue's dedication and professionalism, coupled with his values of social justice and philanthropy, make him not only an incredible asset to Ultra Marathon Caballo Blanco, but also a valued collaborator and friend to Norawas de Raramuri. All your donations go directly to the Raramuri of the Copper Canyons. Norawas operates as a 100% volunteer organization. With your help, Norawas de Raramuri creates and sustains projects revolving around the health and culture of the Raramuri People of the Copper Canyons. We seek to bring support and sustenance by working locally and unintrusively, whether through providing corn and non-GMO seeds as prizes to Raramuri runners or developing health or education initiatives. Norawas de Raramuri provides funds to purchase tons of food and seeds every year to be awarded as prizes to Raramuri runners competing in the international event Micah True created in the Canyons, which was later depicted in the book Born to Run by Christopher McDougall. According to the race's tradition, "Everyone wins". Every Raramuri who runs 1 loop (20 miles), 2 loops (40 miles) or 3 loops (50 miles) in the event is guaranteed to be awarded vouchers for the purchase of basic food products at government-regulated stores throughout the Canyons. Furthermore, all top ten male and female finishers receive additional quantities of corn as prizes. "Light, is a gift given in the spirit. Breathe in the dawn to the Universe. Breathe out a prayer to yourself. Will you ever begin to understand the meaning of the very soil beneath your feet? From a grain of sand, to a great mountain, all is sacred. Yesterday and tomorrow, eternally exists in this sacred place." - Augustine Ramos, Raramuri Shaman. Throughout this past year, Norawas de Raramuri, has been blessed by generous, heartfelt donations from runners world wide. In a Grass Roots campaign, with gifts of cash, coats, blankets, running apparel, the message of Hope returned from our friends in California, Arizona, Colorado, Indiana, Washington, Texas, Sweden, the Czech Republic, Montreal, Canada, France, Australia, the U.K., and beyond. Norawas was honored to provide the winning team members of the event, with Vales (food vouchers), which are redeemable for necessary staples as rice, beans, corn, flour, and non GMO seed corn for their families. We arrived at nightfall in Huisuchi in cold darkness, to a humble home of warmth and beauty. Filled by a shared dream of honor, respect, and peace, our generous hosts, prepared delicious hand-patted, blue corn tortillas, and savory, garden vegetable soup to every guest. Afterwards, we encircled a glowing campfire as we shared stories of our adventurous trip, and reunited with many friends who have shared years of laughter and running with Micah True, El Caballo Blanco. We camped with the Raramuri runners from Team Urique. The girl's Mentor/Coach, Ultra Marathon Champion, Beatriz Adriana Mendez, from Chihuahua City, is inspired and devoted in supporting both the running, emotional and educational needs of such deserving ladies. The following day, Beatriz ran the entire Marathon course with her girls. They giggled in delight, as they received new running shoes, blankets, vales and running apparel for their victorious efforts. This long-distance running event is more than a diversion for the Running People of La Sierra Madre. They are extremely important for maintaining social cohesion between the families who live miles from one another. Audience participation is high, with hundreds of family members and friends running alongside, offering encouragement. The race also serves as an economic purpose, for much betting goes on during the event. In the discussion over stakes, nothing is ignored, from pesos, tools, sheep, goats, cattle, and hand-stitched garments. In spite of the betting and deep intensity of the runners, the western concept of competition is virtually absent. Except for the purpose of collecting bets, no greed, or negativity exists among the runners. They simply follow the blessing of their team's Shaman, and smile as the they finish with a post race curing ceremony. The men's traditional sport of the Canyons, is called a Rarajipare,which is a racing competition that combines kickball and ultra distance trail running. Two teams race while kicking a wooden ball along a grueling course throughout the mountainous terrain. The women's version of racing, is called an Ariweta, as they use a hand-crafted stick and hoop. The scoreboard contains a set of rocks lined up in a row at the starting line. Each rock represented a 4K loop throughout the pueblo. As a team completes a loop, the scorekeeper shifts that team's marker, another rock, along the row, showing the completed laps. When the winning team circles around for the finish, their marker is moved to the last rock in the row. As the race continues into the evening, the runners run into the darkness, with flaming, mesquite Ocote-pine branches lighting the sky. Rattles from bells made by gourds, reeds, cocoons, deer hooves, and rasping sticks, bring a primal awareness to this magical celebration. Ultra Marathon Champion, and Batopilas Canyon's Team Captain, Arnulfo Quimare, and his wife Suzanna, greeted all runners with freshly made Pozole soup, and warm, corn tortillas. 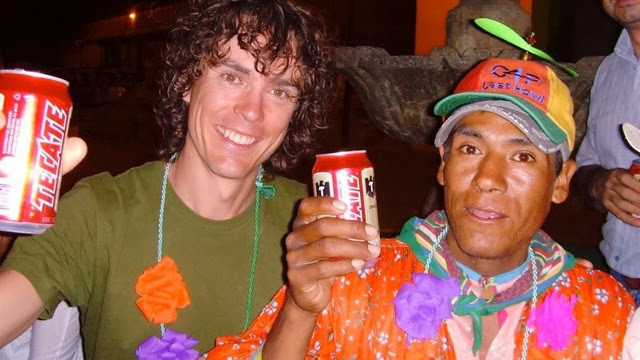 It was touching to notice at the entrance to Arnulfo's front door, photos of Arnulfo and legendary Ultra Marathon Champion, Scott Jurek, El Venado from their racing memories of 2006 and 2007, a humbling example of lasting friendship and mutual respect among all cultures. Later that afternoon and into the evening, I had an opportunity to run, side by side with Arnulfo. I have never experienced such sheer, complete joy in my life. We smiled. We laughed. I whooped and cheered. Manuel Luna, Herbalisto, Silvino, Horacio, and Florenzio, all ran with true freedom. The Raramuri people share a devout, spiritual connection with their ancestors. They believe since birth, that when people walk on the land, they leave their breath wherever they go. So, wherever they run, the Mother Earth, always remembers. And, when they return, they know that the people who once lived there, are in some way, still there, and that we can actually partake of their breath and of their spirit. As the Rarajipare came to a completion, with Arnulfo's team racing to victory, carrying their flaming torches, the men finish their final loop, quietly await a final blessing, savor a final drink of toasted, ground Pinole, and return to their family and friends to graciously celebrate. As I graciously thanked Mickey and Arnulfo for opening their hearts and homes to my friends, Mickey simply smiled, acknowledging the work which lay ahead for the Running People. Arnulfo said, "We are here. We are here with strength. We are here with pride." And, I am here to say we are happy to walk in beauty, with our life long friends. The night had settled in at the Rarajipare, and the crisp, cold air of the high Sierra was biting at us once more. People had been chopping wood all day, in preparation for this time, and little piles were passed around, gathered on the ground and lit along the race course. I joined a little group by the fire. It was Daniel Lieberman and his colleage Aaron Baggish, as well as some members of the organization Native Seeds. We chatted and warmed ourselves with the dancing flames, cheering every time the runners passed by. At a certain point, I felt a little nudge on my leg. I looked down and a tiny boy, probably not more than six years old, was standing right next to me, shivering in his traditional loin cloth and blouse. I moved aside so that he could get a better spot closer to the fire and he stepped forward, remaining very close to me. I am not used to this behavior from the Raramuri; instead, every time I meet them, they usually shy away or stay at a respectable distance, only giving me quick glances and maybe a slight nod to show me I'm being acknowledged. This boy seemed comfortable around me, and I'm sure the presence of the fire more than justified his being so close to our little group. I let him hang out for a little while, then I tried a couple words, hoping he wouldn't run away. He raised his head and looked at me, like I had just offered a million dollars. I went to our truck, and got one of the beautiful, hand-made polar blankets the Ponce family had so generously offered at the Born to Run Ultra Marathons last spring. It was a bright pink with yellow ribbons, just the kind of colors our friends like so much. I walked back to the fire, spread open the blanket and wrapped my little friend in it. The smile on his face said it all. «That is very generous of you», said one of the scientists.